I have been really uninspired and unmotivated to post on this blog lately but as Christmas rolls around, I have a lot of personal DIY projects that will be fun to share. I was trying to buy gifts for a large group without breaking the bank. I got mugs at first but with just a plain mug, it seemed kind of cheap. So that’s when I had the idea to personalize them. I did a lot of research and decided to use heat transfer vinyl. I used a Silhouette Cameo cutting machine to cut out my designs but you could always opt for a simpler design if you’re doing this all by hand (scissors). I was very ambitious with this project (15 mugs lol) so the machine was way more convenient. Heat gun or iron both work for this but I prefer the heat gun over the iron. My iron was too large so I had a hard time pressing the designs onto the mugs and it took way longer for it to stick to the mugs in comparison. The iron also warped the vinyl if you press it on for too long. With the heat gun, I felt like the vinyl adhered to the mug quicker and was much more forgiving if you had accidentally left it over the vinyl for too long. 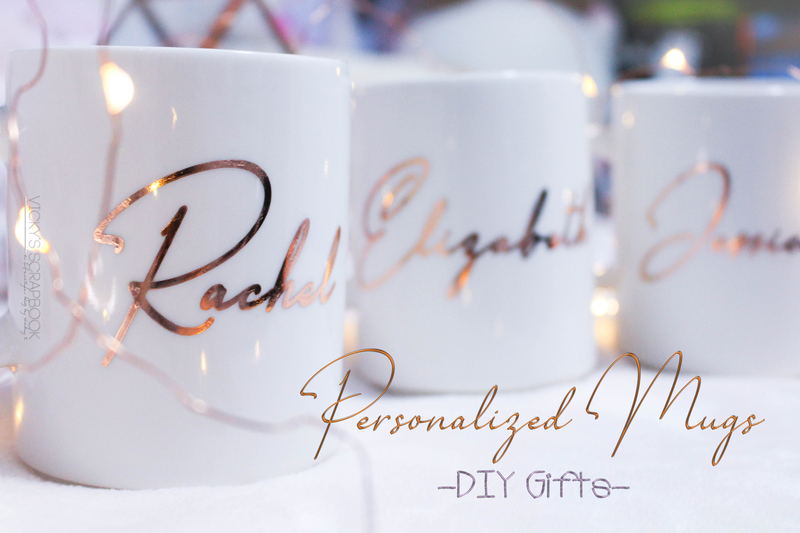 I took about 5-10 mins to stick the vinyl to the mugs (depending on the length of the names) using the heat gun. Are you doing any Christmas DIY or DIY gifts of your own? Oh my, these are simply gorgeous! Oh these mugs look super cute ❤ 🙂 Hahaha I don't have a heat gun, so I can't try this, but I love the gold detailing!